Recycle your pumpkin in style! Residents are invited to drop off their carved pumpkins for all to admire. It's a spooky and fun way to say goodbye to Halloween, and pumpkins are all recycled and composted. Bring your Jack-O-Lanterns to light up Mimico Square and Amos Waites Park on Tuesday November 1st beginning at 6pm. Please bring your own lighter and candles. Volunteers will load the pumpkins into bins for composting the following morning. 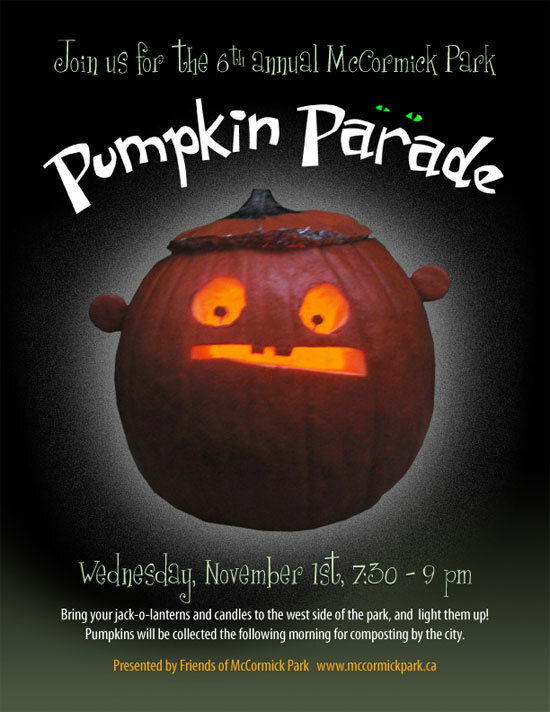 Join us on Wednesday, November 1st from 6-7:30pm for our annual Halloween Pumpkin Parade! Display your creative jack-o-lantern, participate in our drumming circle, mingle with your neighbours and enjoy some free hot chocolate and apple cider (while supplies last!). Free. Bring your pumpkin for a last hurrah! Wander the pumpkin lit paths while enjoying music, cider, cookies, family activities and a candle lit tour of the Bradley Museum. Drop off your pumpkin before or bring it with you and stay for the festivities. All pumpkins to be recycled at the end of the evening. Free. Bring your Jack-o-lantern masterpieces to light up the pathways at the centre. All skill levels welcome. Pumpkins will be disposed of in a responsible manner after the event. Coffee and hot chocolate courtesy of Mary Fragedakis, City of Toronto Councillor Ward 29. Bring your carved pumpkin to Gibson House Museum to showcase your design. Pumpkins will be lit up and displayed through the evening. The Pumpkin Party will include cooking demonstrations in the historic kitchen, hot apple cider and tastes. Discover what your future holds with a fun Victorian-style divination. Free. Know of any other Pumpkin Parades? Share below!